AMAROSA: A new Gourmet fingerling: Rose-red skin, with rose flesh, great boiling, frying or roasting. 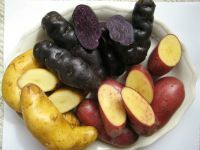 FRENCH FINGERLING: A Gourmet fingerling: Rose-Red skin, a creamy yellow flesh with red rings, wonderful boiled and or roasted. PURPLE Pelisse: Bright purple throughout, delicious when fried or roasted. AUSTRIAN CRESCENT FINGERLING: Yellowish tan skin with a smooth yellow flesh great for for boiling, roasting & frying.